The feedback we received was almost entirely positive. There were some cases where the patients skin was irritated due to external factors not related to the tape. We reached out to some of those where we felt that environmental factors or body chemistry may have played into the the effectiveness of Hy-Tape. Factors such as skin integrity, lotions, and location of the stoma can all contribute to the effectiveness of Hy-Tape, and we ask that anyone experiencing issues with Hy-Tape should contact us. One of the more touching and reveling participants was a 40 year old mother of 5 from Macon Georgia. This amazing young woman homeschools her kids, works part-time and is working her way back to health from a surgery that requires an ostomy (which she has been using for 1 year). Challenges she encountered were pancaking, leaks, and inability to stick when wet. Skin irritation led to raw, bleeding skin surrounding the stoma and average wear time was 2-3 days, but sometimes only 1 day. Are you experiencing any issues keeping your appliance in place? I am applying the tape and it is helping. Have you had any skin irritation? Yes, around the stoma area. Are you experiencing any discomfort during the removal of the tape? No, I use adhesive remover and it helps a lot. Have you had an increase or decrease in the wear time of your pouch? Depends on activity but wore one for 4 days! Yes, by my stoma and around it. About the same as last week, also depends on the output too. Are you experiencing any new issues keeping your appliance in place? Yes, trying to heal from previous weeks. Would you continue to use Hy-Tape? What is your opinion of Hy-Tape? It is amazing, high quality tape that I will continue to use. Any recommendations or comments for the producers of Hy-Tape? 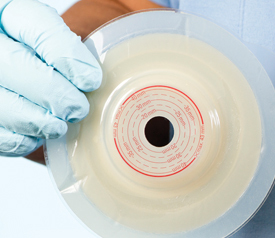 Learn More about how Ostomy patients are using Hy-Tape. Would you like to try Hy-Tape? Click here to request a sample.